I tend not to eat a lot of pasta and when I do it's always brown rice pasta since I've been doing my best to eat gluten free. I'm a fan of the Jovial brand pastas. I'm also on a low sulfur diet so don't eat a lot of broccoli and cauliflower but I couldn't resist this recipe from the Herbivoracious Cookbook. I followed this recipe pretty closely and only omitted one thing, the raisins. I even bought some pine nuts which is a real treat for me. I just love pine nuts but I don't love how expensive they are so doing this recipe gave me a good excuse to buy some. 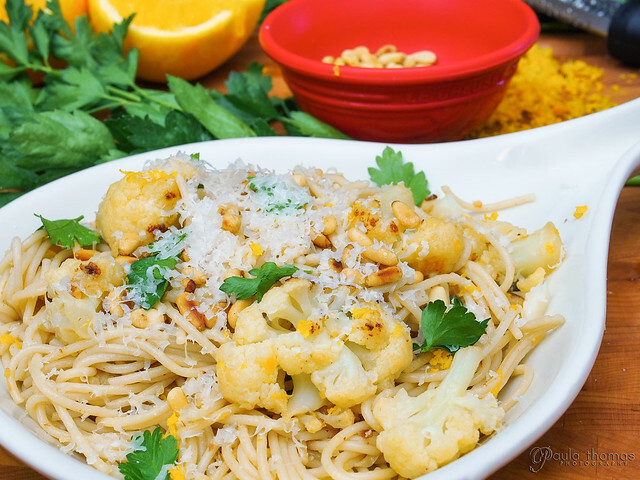 Cauliflower + lemon is always a good combination and the added orange juice and zest made it even better. The recipe also suggested adding some of the pasta water at the end if it's a little dry and I should have added a litte more to soak up all of the goodness stuck to the the bottom of the pan. This dish makes really good leftovers too.